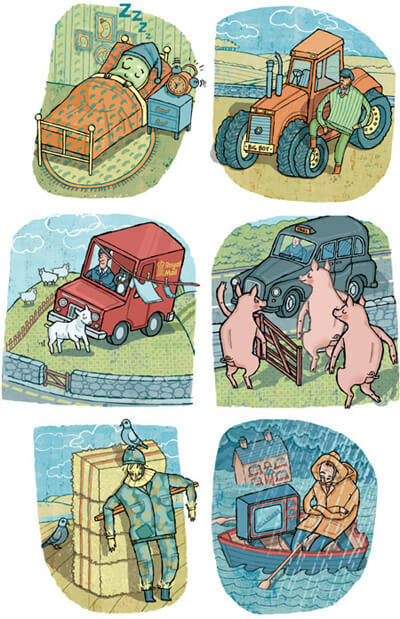 New editorial illustrations by Elly Walton, to accompany funny stories and comments in a farming magazine. Established illustrator working within the fields of editorial, advertising, design and publishing. Clients include BBC, Nestle, Sky, Harvester Restaurants, Thomas Cook, Bayer, The… Show more. Send a message directly to Elly Walton. Established illustrator working within the fields of editorial, advertising, design and publishing. Clients include BBC, Nestle, Sky, Harvester Restaurants, Thomas Cook, Bayer, The Guardian, The Times, The Independent, The Big Issue, Waitrose and National Geographic amongst many others.